The BSCI is running a 50 mentored cardiac CT cases course. It takes place at the RSM in London on 25th February 2014. The programme and faculty (including several experts from Wessex) looks excellent. I’ve tried my best to take on board the feedback I have received about the SpR training days both from individuals and also via the STC. My aim has been to go back to the style of days that we held when I first came to Wessex, ie once every 6 weeks or so, at the various hospitals around the region. They were a great opportunity to see the hospitals that you may not work in and get to meet the consultants. They were also a great opportunity to get to know the other SpRs from around the region. There was a general feeling that national meetings such as the cardio-renal should not be part of the training rota, however you will see that I have included the heart valve study day which is partly being organised by Benoy and looks like a really great day which will be relevant to all. In addition, for a national meeting it is fairly low cost. Please register ASAP. The BCS is compulsory so that is also included. I hope you all understand that I can’t please everyone but if you have any comments, please feedback. I have also stressed the need for SpRs to be released from their clinical duties for training days and this has the full support of the STC. If you are having difficulties with obtaining study leave then please let me know and I will fight your corner! We will be keeping a register for attendance in 2014. Your ARCP requirements is 60% attendance for the year but please bear in mind that with nights, annual leave etc, this will be tight so you should be attending every day you can and not picking and choosing subjects. May I remind the fellows that the majority of you are still pre CCST and hence this also applies to you as your certificate will be in General Cardiology. A one-day course on cardiovascular magnetic resonance (CMR) imaging designed to introduce the basic concepts of CMR and it application in daily practice. Delivered by experts in the field with an emphasis on clinical application and real life cases to enable attendees to appreciate the indications, interpretation and impact on management of common cardiovascular conditions. Wessex SpR Benoy Shah is organising this excellent event covering core knowledge in valve disease. It is likely to be of interest to junior registrars or anyone wanting a refresher. It is only £50 (£30 for BHVS member) and hopefully should be a good day's education! The next Hampshire Heart Failure Group meeting takes place on Tuesday 10th December, from 7pm, at The Winchester Hotel, Worthy Lane, Winchester, SO23 7AB. There will be a series of case presentations from 7.15, followed by dinner. The menu is available here. As always the meeting is sponsored by Servier. Please confirm your attendance and menu choices to Sarah-Jane sarah-jane.dyke@uk.netgrs.com by November 29th. There is an echo training day designed specifically for Cardiology Trainees at the Royal Society of Medicine on Wednedsay 4 December 2013. This meeting, being held jointly by the BSE and BJCA features many of the UK's top echo consultants and tackles both key clinical echo topics and the central goals of competency in echo and accreditation for core cardiology trainees. The cost to trainees is just £40 for this one-day course with lunch and refreshment breaks. RSM trainees pay a further-reduced rate of £30 per day. 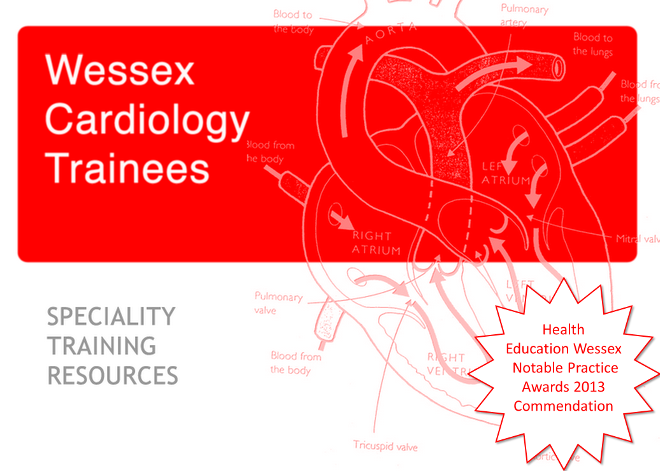 The next official training day is taking place at Southampton on 7th November, in the Heartbeat Education Centre, starting at 9am. Access the programme here which looks excellent and features excellent speakers. The day is also open to the regional ACHD network, so registration is essential. Please email tara.bharucha@uhs.nhs.uk ASAP with your name, GMC number and any dietary requirements. Please let me know if there is any specific reason why you are unable to attend. All of your seniors acknowledge the importance of these training days and whilst some clinical commitments are unavoidable, some situations can be resolved in advance. Janine Pöss, member of the ESC Cardiologist of Tomorrow nucleus, is putting together a panel of trainees interested in editing the ACCA ESC e-learning platform. The task would be to work together with senior authors and to reorganize the chapters written by experts into online modules. The "junior" contributors will appear as co-authors of the respective chapters. This is a great opportunity to increase knowledge and to work together with leading experts in the field of acute cardiac care. If you are interested, please let me know and I will pass on your details. This meeting is aimed at all those interested in research. Please find below the programme for the EP training day. Please don't forget to let me or Dr Dom Kelly know if you are unable to attend. 1415 Improving success in AF ablation: new tools or techniques? Please ensure you have made arrangements to attend the next official Wessex SpR training day, which takes place on October 14th at Southampton General Hospital, arranged by Dr. Yue. Speakers have been confirmed and a live case arranged. The programme will follow shortly. Please let me or Dr. Dom Kelly know if there are likely to be difficulties with attending. The BSH recently announced to their membership the ‘BSH-Servier research fellow award’. This award will be given to the candidate deemed by the board of the BSH to have submitted the best research proposal in heart failure. The prize will consist of 2 years of funding through a grant provided by Servier. The BSH website (www.bsh.org.uk) has more information on the research award. So I write to you, and please could you direct any aspiring research fellows to the site (the closing date for applications is quite tight – September 27th). The next supra regional subspeciality training day in intervention takes place in London at the RSM on the 9th October. All Wessex trainees are welcome to attend. Please see http://www.rsm.ac.uk/academ/cde23.php for more details. Please see the following details for the training day next Friday taking place in Basingstoke. It looks excellent. Please make every effort to attend. For further information, please see link. Registration is also free if you give your details to Louise Batty, louise.r.batty@gmail.com or to your SJM or Biosense Webster rep.
For further information, please see link. The day promises to be an excellent opportunity and I can't reiterate enough that the earlier these topics are addressed, the easier it is to tackle them in an NTN, fellowship or consultant interview. Added to that, this day is free for trainees. Can you let me know by emailing Dominic.Kelly@hhft.nhs.uk? The training day at Chichester is fast approaching. The programme is currently being finalised, but it promises to be an excellent day for trainees of all levels, with coverage of a range of topics from management through to consultant interviews and presentations. Those recently appointed consultants will attest that they wish they had trained in these topics earlier, particularly when this training day is at no expense to the trainee! In addition, there will be an opportunity for mock interview and presentation practice. In order to confirm arrangements, can you reply to this email or contact Dom Kelly at the earliest opportunity? For further information, please see attached programme. To book your place, please contact course directors: Dr Andrew Hogarth, email: andrew.hogarth@leedsth.nhs.uk or Dr Lee Graham, email: lee.graham@leedsth.nhs.uk , or Tel: 0113 392 5787. The July SpR training day will be the regional ACHD meeting, focusing on coarctation. The programme looks excellent and covers all aspects from diagnosis to intervention. Click here to view the agenda. The day is open to all. Trainees must however register by emailing yaso.emmanuel@uhs.nhs.uk. Our SpR colleague Simon Claridge has organised a meeting on July 18th at the Chesil Rectory, Winchester, starting at 7pm. Hakim Megadmi (QAH, Portsmouth) will speak on Nuclear Medicine including sample cases and how best to use MPS. Dinner will be provided at 8pm. This will be an excellent opportunity to cover these aspects of the syllabus. The next Regional ACHD Training Day will be held on Friday 20th September 2013. This training is open to all Congenital Cardiac Consultants, SpRs, specialty doctors, nurse specialists and allied healthcare professionals. The closing date for registration will be Friday 30th August 2013. Please note that due to catering no applications can be accepted after the closing date. Click here for the programme and here for the invitation/registration letter. This evening meeting is open to trainees in the Wessex region. Paul Kalra will educate us about Novel Oral Anticoagulants. The meeting is sponsored by Pfizer and will include dinner and drinks at this nice restaurant in the region. Here is a reminder of the training days scheduled for the rest of the year. Please cancel clinical commitments where possible. Please note some newer dates including the management day at Chichester in August. The Cardiorenal Forum (CRF) is an independent group formed in 2006, and includes Paul Kalra from Portsmouth. The key objective of the group is to highlight the important clinical overlap that exists between patients presenting with a primary cardiovascular or renal problem. The Annual Meeting is open to all with an interest in this field. In previous years Wessex trainees have found this event very enjoyable. The BSH board elections are happening as we speak. All BSH members would have received voting papers in the mail. There are 3 candidates local people standing for election. Paul Kalra is standing for deputy chair, I am standing for counsel and Jayne Masters (SUHT senior HF nurse) is also standing for counsel. I think it is really important that we try to get local reps onto the board to maintain a national profile for wessex. In addition it will prevent the centralisation of control to London centres. Thankfully, the voting process allows you to vote for dep chair and 3 different counsellors so you won't need to choose between us!!. I'm told that very few votes are actually returned so 1 or 2 could make a big difference. If you are a BSH member please remember to vote!! The next Hampshire Heart Failure Group meeting takes place next wednesday, at the Winchester Hotel. The meeting starts at 7pm with a talk from Alex Lyon, Consultant Cardiologist, The Royal Brompton. Case studies and dinner to follow. Dinner is kindly provided by Servier. If you are planning on attending, please let Sarah-Jane know your menu choices ASAP. As you know, University Hospital Southampton are hosting basic cardiovascular intervention, which is a two day course including lectures, angio reviews, live cases and simulation training. It will cover all aspects of the intervention curriculum including speakers from all over the UK, many of whom have national/international profiles. The course would be suited to anyone doing intervention training or interested in intervention as a potential career. The programme can be viewed here. Millbrook, the company organising it are only allowed to advertise the course via the BCIS website or their own website. Deaneries will not send group emails on their behalf to advertise it. So only those people on the Millbrook e-mail mailing list or those who have actively looked at either the Millbrook or BCIS website will be aware the course is happening! This course is designed to provide candidates with a thorough grounding in the latest surgical materials and skills relative to the implantation of cardiac rhythm devices. This course is run in association with the British Cardiovascular Society (BCS) and Heart Rhythm UK (HRUK). Please find below the outcome of the STC meeting on Friday 15th March. I am keen to represent all Trainees at these meetings so please contact me on sjgroves@hotmail.com if you have any training concerns. PYAs will be on 6th September 2013. ARCPs will be 6th September and 10th September 2013. Great news! Dr Dom Kelly has agreed to take over the training days from Dr Paul Kalra to reinstate the once educational and social SpR Training days. The plan is have 8 regional training days and separate to this BCS x2 training days. Dr Kelly will publish the 2014 training day dates by the end of 2013 so SpRs can ensure clinics are cancelled for the next group of SpR's following on in their post. I highlighted the Echo clinics were not being cancelled in Southampton and Dr Calver agreed this should occur and with more notice we should be asking all SpR clinics are cancelled so Trainees can attend the necessary 60% of Training Days. Training days had been a time for education but also for socialising with our peers and increasing our working relationship...not to mention tips and hints for forthcoming ARCPs! I would really encourage Trainees to ensure clinics are cancelled for the Training days to allow the majority of Trainees to attend. Dr Tom Farrell has put together a document to be released on the "Eportfolio Roles and Responsibilities for the Trainee and Ed Supervisor". The document outlines who's responsibility different sections are to complete, when, where and how! Also just an early warning before PYA and ARCPs this year, we are now expected to complete Patient Surveys! Only in ST5 and ST7 but still required. If you are using curriculum 2007 please do not fill out any of 2010. The Ed Supervisor must release your MSF Summary prior to your ARCP. James Rosengarten and myself are going to take over the Trainee Survey. As a Deanery, Wessex scored badly on the GMC survey but the reasons why and comments are never seen by the Deanery. James & I have offered to take over the Trainee Survey to allow Trainees to be as honest as they like about the posts they are in or previously been in. We'd like to hear the good, bad and any recommendations you think would improve the post for the Trainees coming after you. We have asked the Deanery allow us to run this and we will do the investigating rather than have Consultants involved. We hope to have an electronic survey up and running by June/July and really appreciate everyone completing it! I'm looking for brutal honesty please!! Currently we are all using our ARCPs as Revalidation but it has been asked if the Trainees CCT date alters for OOPE/R, mat leave, sickness it is the Trainees responsibility to inform Vykkie Winstanley at JRCPTB who will adjust they CCT date and inform our Deanery who in turn updates the GMC and a post CCT revalidation date is generated. As I said please contact me if you have any concerns or recommendations. Just when I thought I had distanced myself from the Wessex SpR rotation, I have been handed the,"honour", of organising this in the place of Paul Kalra who has exponetially increasing clinical and research commitments. There are some sessions booked by Paul already for this year and i'll get these dates out as soon as possible. My efforts will really kick in next year. I'm very keen to move back to the model that was in place when I started as an SpR in 2006 with around 8-10 or so local meeings held at hospitals in our region. I would like to avoid incorporating national meetings in London etc as I think these types of things should be attended as separate training through study leave (other than the BCS). I will aim to produce a comprehensive timetable to cover all subspecialities and general cardiology as well as management and research. In addition I intend to be much more stringent about monitoring attendance. There will be a register at each meeting which will be fed back. In addition I will send out assessment forms after each to maintain quality, the forms will need to be completed whether or not you attended and if not able to, reasons why. The reason for this is completely for your benefit as if it becomes evident that attendance is being restricted, I will very much fight in your corner to put pressure on Trusts to fix this. If anyone has any thoughts or comments, please let me know. The Salisbury Training day takes place on 26th March and is part of the regular SpR training programme. The focus is coronary intervention, but the day is open to all trainees. The programme includes guest speaker Bob Gerber, from Eastbourne, who will educate us about renal denervation. registration is from 9am, Education centre Level 5, Salisbury District Hospital. Please do your best to attend. The next Specialist Training Committee meeting is being held on the 2nd March 2012. Sam would like to know if other trainees have any issues that they would like addressed at this meeting. Please let her know directly on sjgroves@hotmail.com. Any issues will be addressed anonymously. Please let Simon Claridge know if you are able to attend. I have organised an evening training meeting on Wednesday 27th February at Hotel du Vin in Winchester. It is supported by 'Heartware' who are bringing a speaker from Harefield down to discuss advanced therapies for HF ie VAD and transplant. Places will be limited to around 20-25. As such first come first served. Should be excellent presentation and refreshments. Details of the training day programme are coming in as dates are confirmed by Paul Kalra. March 26th is being hosted by Salisbury - final programme to come. As usual, please cancel clinical commitments so that the attendance is possible. Paul is hoping to arrange an evening meeting in late February. I've only just been sent notice of the programme for tomorrow, so apologies for those that had been asking. The day is at the Portsmouth Marriott hotel, just near to QA hospital, and starts at 9.30am.